Top 8 Health Benefits of Using an Air Purifier: Clean air is as much essential for our survival as the purified water. However, all of us are aware of the degrading quality of the air we breathe due to a lot of human factors such as industrialization, urbanization, deforestation and the most important one, air pollution. The dirt particles or the impurities are suspended in the air despite you were claiming to sit in the cleanest environment possible. These impurities and pollutants present in the air could be very harmful to the overall health of human beings as well as animals. And when we talk about ourselves, it could give birth to numerous health problems which could also be chronic. Now, to curb this grave issue, i.e. to reduce the pollutant concentration in the environment, we can use air purifiers. Air purifiers are the instruments or you can say appliances that help in removing the air pollutants. It is very helpful for those individuals who are struggling with the breathing or respiratory diseases such as asthma, bronchitis, allergies etc. It can also be helpful in getting rid of the smoke in case someone in your house is into the habit of smoking. There could be millions of allergens present in your home environment or the professional workspace which can cause an allergic reaction in your body especially if you are susceptible to hypersensitivity. 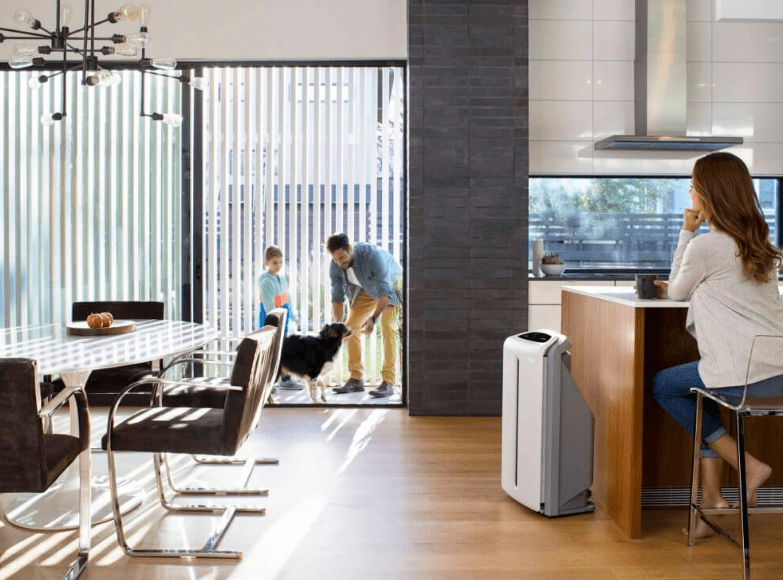 In case any of your family members has a problem of allergy, then you must go for using air purifiers to make it easy for the sufferer to live harmlessly. It is always recommended to choose such an air purifier for your home that can efficiently remove the pollen particles, mites, pet dander and any other allergic component present in the air. Also, it should not emit ozone gas as it can also be an allergen. One of the major reasons for acquiring lung diseases is the inhalation of smoke or smoking cigarettes. So, even if you do not smoke, then also, you can suffer from chronic health issues and medical conditions such as COPD (Chronic Obstructive Pulmonary Disease), cardiovascular diseases and cancer. All this could occur by simply inhaling the cigarette smoke. The children and those suffering from breathing problems are more susceptible to suffering from lung diseases due to the inhalation of secondhand smoke. Therefore, an air purifier can be used for cleansing the air and making the air free from any carcinogens present in smoke or tobacco. The high-quality air purifiers contain HEPA filters and activated carbon filters that can remove even the smallest of the particles and are more efficient. An air purifier is capable of removing 99.99 per cent of germs and dust particles present in the air. This can be very helpful to those individuals who are suffering from the flu. It will help them in breathing clean air free from any contamination. If you opt for a good purifier, then you can also prevent suffering from viral infections such as common cold and influenza. Air pollution has led to an increase in the number of individuals suffering from asthma. Hence, we require taking precautions by breathing only clean and fresh air. If some of your family members are already struggling with this breathing problem, then using the air purifiers’ help in reducing the intensity of asthmatic attacks by making sure that there is a minimal concentration of air pollutants in the atmosphere. Asbestos now a day is quite uncommon to be present in the air but still, some homes and places have asbestos. Asbestos is a type of mineral which is utilized for various types of works but otherwise, it is quite dangerous for health. It can lead to cancer and chronic respiratory problems. An air purifier would help in relaxing with respect to any asbestos particle in the environment as it will trap all these particles safely through fine filter sheets. Therefore, it won’t affect your lungs. Radon gas results from the combination of uranium in soil or water. There are various houses and public places such as buildings. It is one of the biggest causes of lung cancer. One can always go for using an air purifier in such a case along with sealing of all the cracks present in the walls or floors of your home. You should also improve the ventilation of your home and other necessary precautions for avoiding the inhalation of radon gas. Too much inhalation of carbon dioxide and insufficient breathing of oxygen can lead to many health problems. Many problems such as shortening of breath, dizziness, feeling nauseatic, increase in blood pressure, excessive sweat and loss of consciousness could be dangerous for the life of an individual. To keep you safe from the poisoning of carbon dioxide, you should install air purifiers with HEPA filters. It will help in reducing the concentration of carbon dioxide from the air. One of the most problematic complaints is the presence of insects and the irritation caused due to mosquitoes. As these could definitely carry a lot of germs and make your health ill.
Air purifiers could help you in eliminating all these frustrating insects from your home and make you feel safe in a healthy way. Therefore, these are the top 8 amazing benefits of air purifier which you must read for your own health benefits and wellness.